$185 includes all materials. Create 4 works of art using watercolor, alcohol ink and encaustic. Paint loose watercolor art in guided lessons. 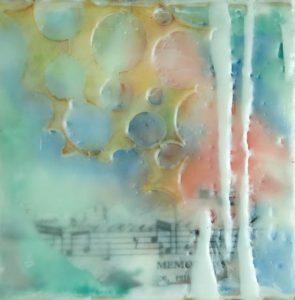 Then encapsulate and protect your work in luminous encaustic layers, embellish with ephemera and add finally add the “IT” factor. Alcohol inks add dimension and vibrant color to this mixed media artwork. Your work will need no protective glass and will be ready to hang! No experience necessary. For class descriptions and directions use the registration link.